Niibl wrote: Lots of pinning to do as well, due to the weight. But first things first- I need to keep it from toppling over. I need to build a base. 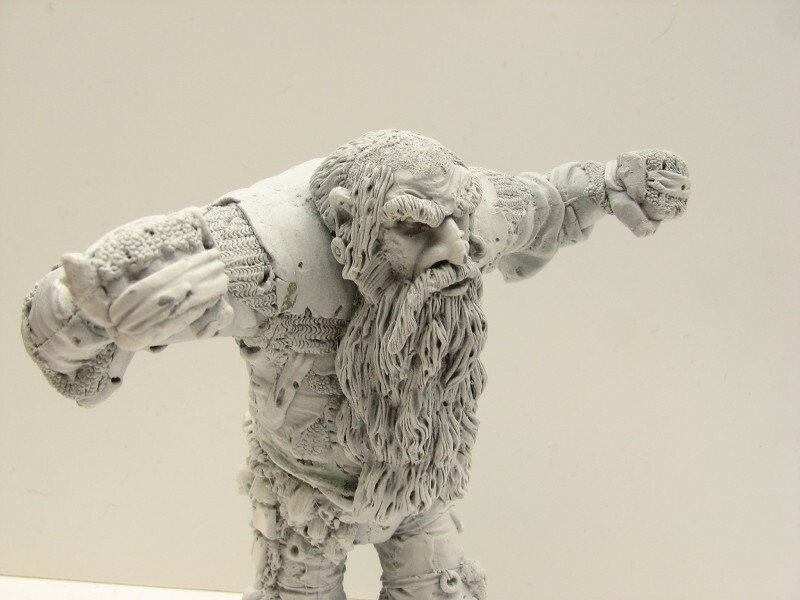 One thing I loved about the Marauder giant was how well it went together. I opted for a larger base than normal because of the toppling issue. Harry wrote: Here's mine ..... eaasiest colour scheme EVAAAAAAARRR!!!! I've seen him before (probably on Warseer?) and love what you did with him. Harry wrote: I Also like collecting giants ... However, I have managed to paint a few ..... do you want to see my painted ones? Do Ya? At the end of the month I was going to post a pic of the giants I've finished, plus a group shot with the rest of my painted giants. One of my favorite pages at Stuff of Legends is Richard/Orclord's giant collection. I confess to sometimes just visiting the page and drooling over the collection. Maybe we should start an entirely separate collective giant show-off thread? My own progress, as promised, here's what "came to mind." Just base colors blocked out so far. ZeroTwentythree wrote: Maybe we should start an entirely separate collective giant show-off thread? "Show off your big 'uns" ? You're right. You could spend several months painting that one giant. Especially factoring in the platform. 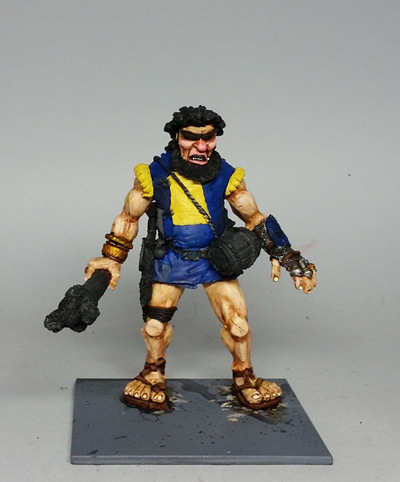 I am up late tonight, trying to catch up a bit of the Marauder giant, and he's finally coming together. I did take a few shortcuts. I would guess about 90% of the painting is done. Refining a number of areas, details, etc. and then on to the base. I had started writing up some background for him, but didn't like the way it sounded. So I will get back to that at some point. Should i replace the squashed, crooked skull? Such questions can drive me mad and can delay projects for months. Still, I thought it would be time for a picture. In addition, I used the opportunity to take one of my old beast man giant as well. shall i cut it off? And replace it with WHAT? 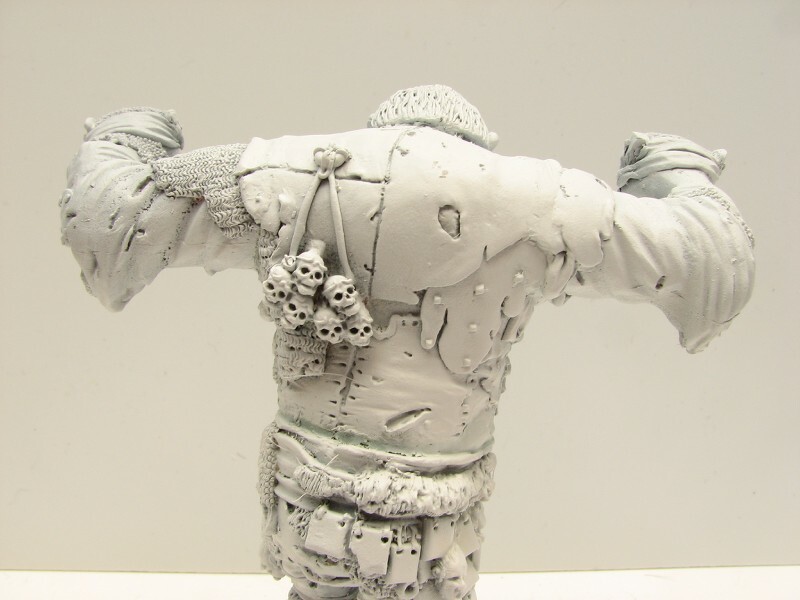 old spawn action figure conversion, from a time when giants needed to be on 50mm bases, at least for tournaments. I agree, keep the skull. 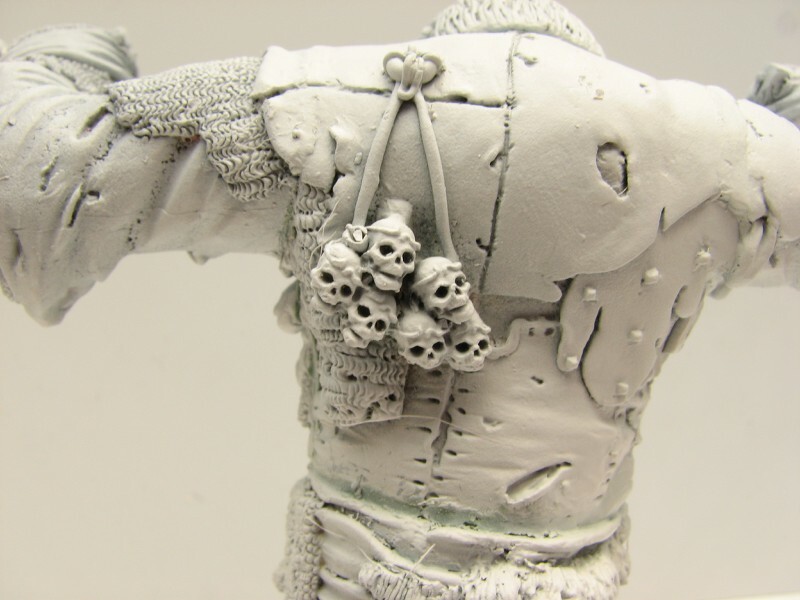 It's got a charm to it, and doesn't really need to be perfectly aligned on a functional/used battle helm. That re-purposed action figure is amazing! The painting is beautiful, and the pose looks nicely balanced. How much of that is your sculpting? 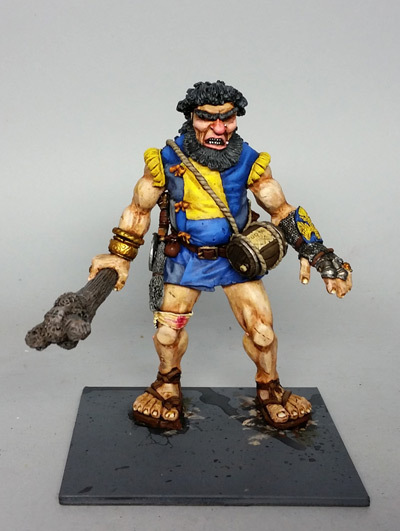 I finished up the painting on the Marauder giant, but can't decide what to do for the base. 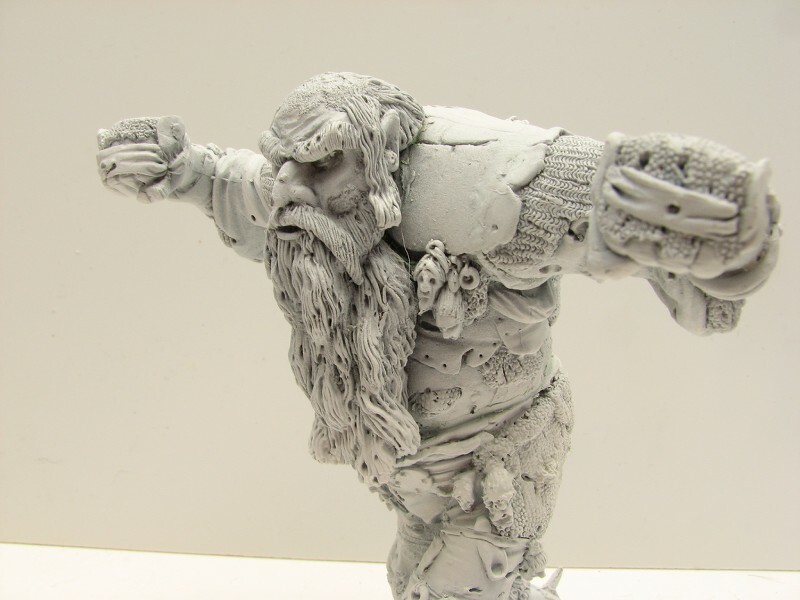 While I give that a bit of thought, I've started on the next giant -- the Ultraforge giant. He's the largest giant I've got. 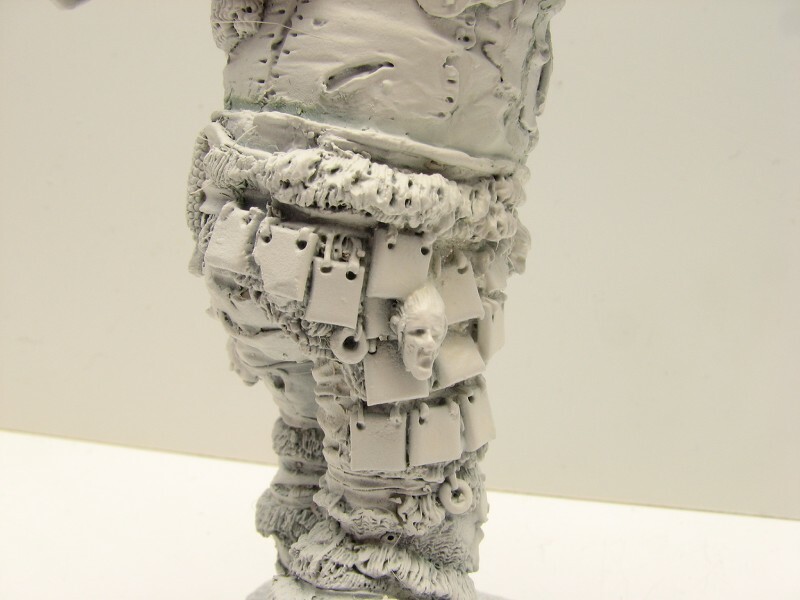 Pretty well sculpted, though not as nicely cast as the Marauder or Warploque giants. He required the most clean-up of the four I'm attempting to paint this month, and there are still some visible mold lines/slips. 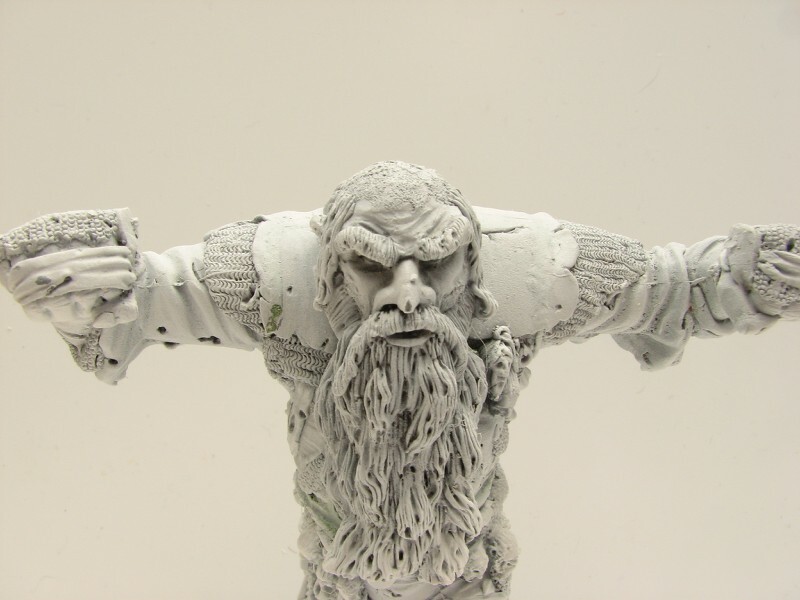 The resin is lightweight, which is a nice change from awkwardly handling the lead Marauder giant while painting. 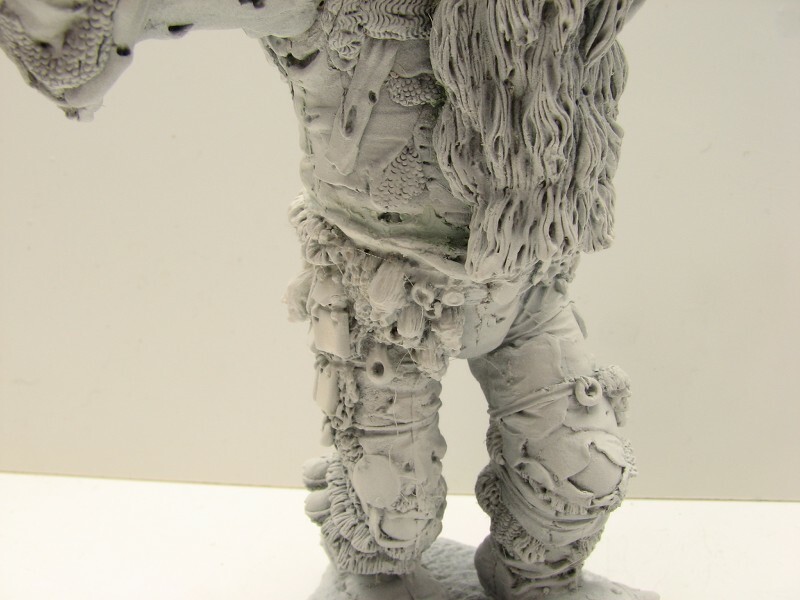 The big guy is mostly flesh surfaces, so I'm trying to keep that interesting. I put a bit of work into that tonight, but still have more refinement & clean-up. His face still looks a bit like raw meat. (Not that that's entirely a bad thing...) The colors aren't quite coming through in the pics, but I hope they give a good idea where it's going. 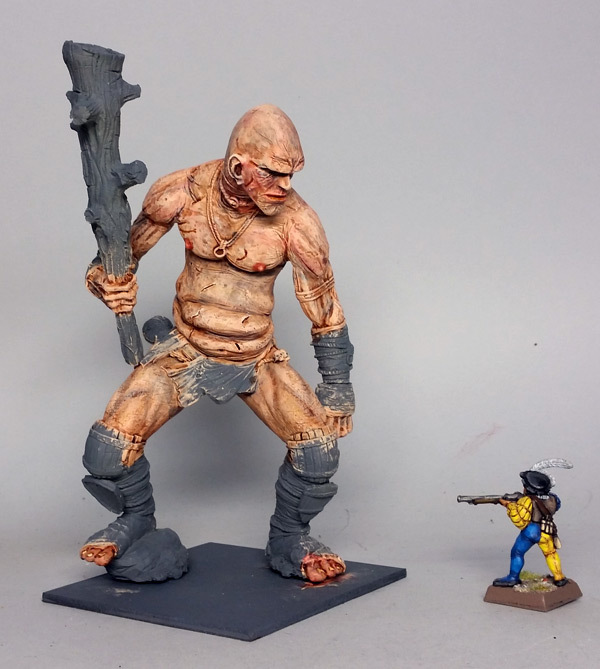 Nice work, your putting me to shame, I must sit down this week & finish mine (might not get the goblins done , but the giants certainly a good prospect). The design is somewhat rough but the model still has much potential and I am sure that you will make a stunning model out of it. So I will keep the Skull on the helmet, but I will probably add some GS to smooth out the offset. 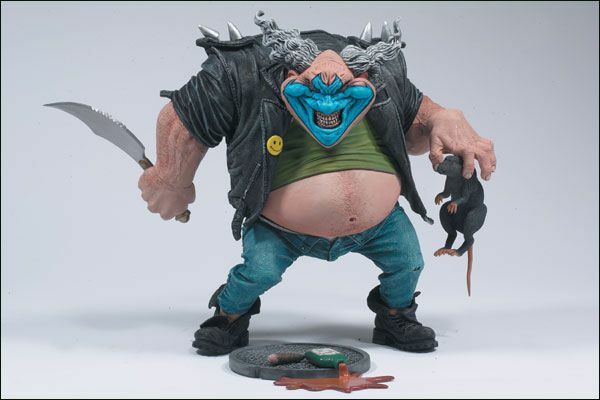 I hope I will have the opportunity to come home early this week, on a day with some sunshine, so that I can prime that guy properly. I think I have never painted such a beast before. 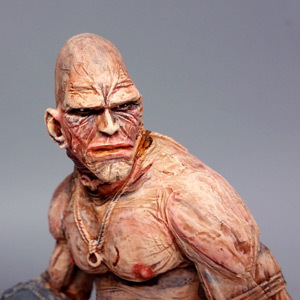 The beatsman giant was based on this guy. Mostly I covered the clothes with green stuff, added tusks and horns and resculpt the breast area. I instantly "saw" the pose when I saw the figure in an online shop and just had to do this. There is a lot of fishing lead in that base to keep him upright. still, the table should not be rocked too much. OK, settled down for an hour or so today and have managed to add a few more bits of paint, estimate I should be able to start adding the detail in the next couple of days with a bit of luck. He's coming along really nicely!